Familiar Name at the top after Games 6 and 7. Game 6 of the 2017 Season saw a meeting of two of the leading teams with Onchan A hosting joint top team Peel Sunset A at Onchan Park in what promised to be a very keenly contested match. At the end of the afternoons bowls it was Onchan A who ran out 5-3 winners with some close games with Peter Wallis maintaining his early season form by beating Alec Taylor to 19 and for Peel Harry Kelly beat Colin Hinds to 19. Worthy of mention is the performance of Tony Carroon who beat local favourite Mike Thomas to 12. Elsewhere Onchan’s B Team travelled to the Villa to play Douglas B and they former made it a good day for Onchan as they came away with a 6-2 win with Tony Creer and Bob Banning being the two winners for the home side. Douglas A travelled to Peel to play Peel Sunset C and the ‘Westerners’ gave the men from the ‘Capital’ a good test with the Douglas side eventually winning 5-3. Ballaugh B hosted Port St Mary B with the latter getting a 5-3 away win in a match that featured an epic struggle between Bobby Clayton and Steve Franks with Steve eventually winning 21-20. The A Team of Ballaugh travelled to the south to play Castletown A with the Castletown side taking a 6-2 win in a match that saw a close battle in which Ron Williams beat Peter Graham to 20. Castletown B travelled to Nobles Park to play Nobles B with the team from the south winning 5-3 while Nobles A took the journey to the Mooragh Park to play North Ramsey B and it was Nobles A who came away with a 5-3 victory. Marown welcomed South Ramsey to Crosby and played out a 4-4 draw with a close game between Keith Watterson and Chris Walsh saw Chris running out with a 21-20 win. In the remaining two games we saw Peel Sunset B losing at home to North Ramsey A and Port St Mary A beating Finch Hill 6-2 at Port St Mary. As we came to Game 7 there was only one team left unbeaten in the League, this being Castletown B who hosted Douglas A on a very tricky Castletown Bowling Green. After the first four games the match looked to be all over for Castletown with the Douglas side leading 4-0 but then acting Captain for Castletown for the day Juan Kermode started a comeback with a 21-9 win over Pat O’Donohue and Dave Hollingworth and Alan Phair winning this could well have finished with the Southerners remaining unbeaten. Jimmy Sansom however showed he is made of ‘stern stuff’ and remained focused to see off a spirited challenge from Dave Ali so Douglas A came away with a 5-3 win feeling very relieved with the result. Also travelling to the South of the Island was ‘high flying’ Peel Sunset A who played Port St Mary B with the boys from the South putting on a great display to beat the Peel side 5-3. There were some good wins here for some of the Islands ‘senior bowlers’ with Archie Callister beating Harry Kelly 21-12 and Ashley Qualtrough beating Jeff Oates to 13. Ballaugh B fought out a 4-4 draw with Nobles B while Ballaugh A travelled to Nobles Park A and had a similar 4-4 result. Castletown A took a 7-1 victory from Douglas B at the Villa with Arthur Ashcroft being the Douglas sides only winner defeating Derek Lewney 21-17. Onchan A hosted Peel Sunset C and achieved an 8-0 victory with Peter Dawson being the closest for Peel C going down 21-20 to Brain Woodall. Onchan B went south to play Port Erin and lost 5-3 which was quite an achievement for the Port Erin side as they were a player short. Port St Mary A did well to get a 5-3 win from a good Peel B side who play so well on their home green. Finch Hill hosted North Ramsey A and the lads from Ramsey managed to get a 4-4 draw while back at the Mooragh Park North Ramsey B lost 5-3 to a strong Marown team. So after seven games have been played with see the familiar sight of Castletown A at the top of the League equal on 12 points with Onchan A and Port St Mary A just one point behind. With only two points covering the top two places we have Nobles A, Marown and Port St Mary B all close behind on ten points. The weather was not kind on the morning of 25 April in the Trend sponsored over 60’s ladies’ league. At Peel the match coincided with the period of high tide, so the cold and strong winds were accompanied by the sea spray coming over. For Breagle Gwen Tuck and Sylvia Maddrell mastered the conditions to take two games of the home side. Onchan recorded a maximum at Moorage Park, where just two of the home side managed to get into double figures, while at Douglas Jan Osborne spoiled the party for Port St Mary A, denying them a full house. Sue Caley almost added a second game for the home side, reaching 20 against Kath Looney. Port Erin had a good win against Castletown, winning four games. All the Castletown players reaching double figures kept the final points difference to single figures. It was another close affair when Port St Mary B played host to Villa, the match ending level on games with the visitors finishing just ahead on points. Ballaugh and Nobles also tied on games, but with the home side winning two games to single figures compared to their opponent’s one they ended with a comfortable points advantage. After four games in the C Tarleton Hodgson sponsored ladies’ league, Castletown are leading the way followed by South Ramsey and Port St Mary. They were top scorers in the matches played on Friday 21 April, dropping just nine points against Douglas. 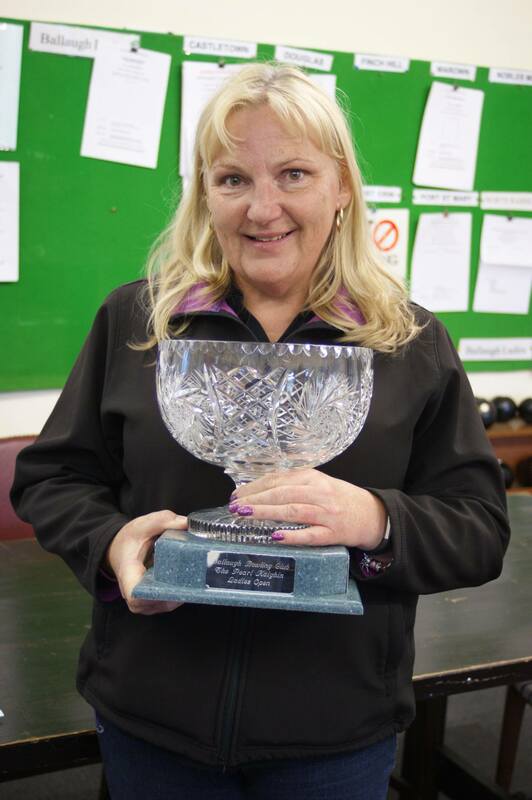 The two winners for the visitors were Mary Black and Jan Osborne who came through 21-20 against Barbara Young. The improvement in the Mooragh Park side was shown in their performance at Port St Mary where they won four games with Vicky Lloyd-West nearly making it five as she lost out 21-20 to Katy Williams. Second placed South Ramsey had a successful trip to Marown, winning 5-4 with three wins to single figures, although there were some close games, with Fiona Kennish reaching 20 against Irene Corlett and Jill Quayle 19 against Philippa Taylor. Nobles have made a strong start, currently lying in fourth place, and proved too much for Ballaugh winning 6-3, with Viv Cooke reaching 19 and Lin Ruscoe scoring 20 against Alison Millard. Peel Sunset had a good night at Onchan where they were made to work for their win. The home side had three winners and it was nice to see them with a full side, and spares! Purt le Moirrey could only muster two wins, courtesy of Tracy Moore and Edwina Reid against a rampant Port Erin who won seven games, four of them to single figures. 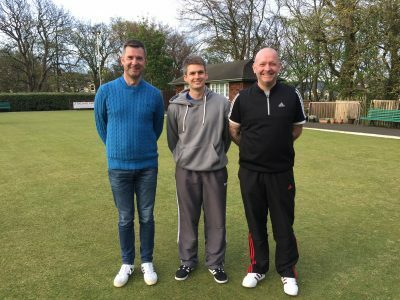 Champions Port St Mary A were ruthless against Mooragh Park in the Trend sponsored over 60‘s league on Tuesday 18 April, posting a maximum in a match where only one of their opponents, Moira Anderson, reached double figures. Peel Sunset also had a successful morning against Villa, winning five games with Pat Kelly being the fly in their ointment as she won her game for the home side. It was much closer at Marown, where despite winning 4-2, Port St Mary B scraped a win by just three points thanks to wins to single figures for the home side by Mary Alderson and Margaret Scarffe. The third round of fixtures were played on Easter Monday with Marown A having a free week, but perhaps being the biggest winners on the night without even playing. Port Erin A travelled to Onchan for their second successive away fixture having lost 0-10 in their first game. They fared slightly better this time taking two points off the home team, who would have been looking to match Marown’s 10-0 home win the previous week. The winners for the visitors were David Cain & Seamus Whelan over Kevin Quirk & Mike Thomas. South Ramsey A had a tough home fixture over Peel A who didn’t disappoint on my early season prediction that they had the players to take points off the top teams over the course of the season with Dave ‘Barney’ Kelly, Tom Kelly & captain Darren Young all picking up strong wins for the visitors to take three points back to Peel. For the home team Stefan Kelly & John Kennish both won to single figures. Castletown A made it three wins in a row with an 8-2 success over Douglas B with four of their players winning comfortably. North Ramsey A hosted South Ramsey B with Gary Merrill, Geoff Porter & Adam Yates all winning to single figures on their way to a 7-3 victory over their local rivals. Port St Mary A made the trip north to Ballaugh with the home side pleased to have taken four points off the visitors having won two games 21-19. After three games Trevor Quayle sits at the top of the individual merit standings having only conceded 13 points in total. Douglas A took an 8-2 victory at home to Castletown B with two of the visiting players losing out 18-21. In the second division Port Erin B were shock winners 7-3 over Marown B, who will be hoping to go up to the top tier following their heartbreak last season. Noble’s A hosted Onchan B with the result ending in a ‘true draw’, the games being 4-4 and the chalks also being tied on 142 to take home an aggregate point each. Peel B used all their home green advantage to obtain an 8-2 win over Port St Mary B who had two players losing out 18-21. Douglas C were well beaten 1-9 on their own green by visitors Noble’s B with Keith Fearnley being the lone winner for the home team and two more of their players just making double figures. Onchan C made the journey north along the Coast road to play North Ramsey B at the Mooragh with the visitors taking three points off the home team and losing out on the aggregate by six chalks. In the third division it was very much a case of advantage to the home teams with Ballaugh B having won 8-2 over visitors Douglas D who had two of their new players John Ferguson and Lee Butterworth managing to reach the magical 21 point mark, whilst Greg Brew had to suffer a 20-21 loss to miss out on his first individual win. Peel C and Marown C carried on the run of home 8-2 wins over South Ramsey D and Peel D respectively. South Ramsey C were somewhat fortunate to win 5-3 on games, but lost out on the aggregate due to two heavy defeats, with the visitors Ballaugh C disappointed not to have taken one or two more individual wins having lost two games to 20-21 and a further game 18-21. Noble’s C and Castletown C had an unusual 6-3 score line in favour of the home team, due to both teams being in the unusual position of only being able to field seven players. Following the postponement of the Team Fours at South Ramsey, Peel took the opportunity to use the free date to host a mixed pairs on their green on Sunday with 33 pairs taking part at short notice. Losing quarter-finalists were Alison Keggen and Neil Withers, Paula and Stuart Garrett, Joyce Ogden and Mike Hargraves, Gill Dixon and Glynn Hargraves. The first semi-final had home greeners Shirley and Gordon Corrin up against Lyn Bolton (South Ramsey) and Trevor Quayle (Port St Mary) with the latter wasting no time easing to a 21-8 victory. In the other semi-final the Husband and Wife pairing of Joyce and Harry Kelly were 20-13 up against fellow home-greeners Mary Moffatt and Dougie Allan, but were unable to get the all important last chalk to lose out 20-21. The final started with Quayle and Bolton taking their time to get into the game, having been sat off for over 30 minutes going 6-12 down, before kicking into gear to go 16-12 up. Moffatt and Allan levelled at 16-16 to then give away three points on the next end. Bolton and Quayle then managed to get the two points needed to become the first winners of the Lancaster Cup winning 21-18. The presentation was made by David Lancaster’s family with thanks given to all those who helped make a success of the competition. The first men’s singles competition of the season was played at the Villa on Saturday with an entry of 51 taking part. Losing out in the quarter-finalists were Neil Withers (Marown), Robert Monk (Onchan), Glynn Hargraves (South Ramsey), and home-greener Jimmy Samson. The first semi-final had Kevin Quirk (Onchan) easing to a 21-7 win over Stuart Garrett (Douglas) to book his place in the final. In the other semi, John Kennish was up against Colin Kelly (Marown), with Kennish taking an early lead before Kelly managed to get the score back to 14-15, Kennish then ran out to secure the victory. In an excellent final Quirk made a strong start with some good leads and length bowls as we have come to expect of him by taking a 11-4 lead over Kennish. From there Kennish started to work his way back into the game to draw level at 15 all. Quirk went on to go 18-16 up, before Kennish took the last five ends with singles to secure the win. At the conclusion of play the presentation was made by Association competition secretary Matthew Keggen, who thanked his team of helpers, Douglas Bowling Club for hosting the competition, with refreshments provided throughout the day and the green keeper for the excellent condition of the green. Close at the top in Men’s Over 60’s League. As we came to Game 4 of the Season the question everyone was asking was whether Onchan A and Peel Sunset A could continue with their 100% winning record to head the challenge for the 2017 League Champions Title and neither of these teams disappointed their supporters as they both had convincing victories. Peel Sunset A travelled north to Ballaugh and came away with a 7-1 win with the Ballaugh Clubs Phil Faragher being their only winner against Phil Parker. Onchan A hosted Finch Hill and they also won 7-1 with only Eric Stanley getting a win on the day for the Finch Hill team with a 21-9 win over Mike Alexander. Onchan B crossed the Fairy Bridge to challenge Castletown A which is never an easy task on the Castletown sides home green and obviously the Onchan lads couldn’t all have said ‘Good Afternoon Fairies’ as they returned home having suffered a 7-1 defeat with their only winner being Roger Payne who beat Peter Oates 21-17. Douglas B lost 6-2 to Port St Mary B at the Villa and Douglas A just had a short journey up the hill to play Nobles B with the team from the Villa running out 6-2 winners. Nobles A a team with the credentials to challenge for the League were away to Marown and the Crosby based side proved to strong for the Douglas men with Marown winning 5-3. North Ramsey B hosted Port Erin with the latter team winning 5-3 and North Ramsey A travelled to Port St Mary A where the home side won 6-2 in a match with some very close games . Peel Sunset B defeated South Ramsey 5-3 and finally Peel Sunset C hosted Ballaugh A with the men from Ballaugh taking a 6-2 victory with Clyde Quine and Phil Clarke being the winners for the westerners. With joint League leaders Peel Sunset A having a bye for Game 5 the other leading team Onchan A travelled to Castletown B and it was there that the Onchan teams 100% record came to and end with a 5-3 defeat. The Castletown A team took the long trek north to play South Ramsey and came away with a 6-2 win with Chas Grills and Bernard King being the only winners for the South Ramsey side. Ballaugh A beat Peel Sunset B 5-3 and the Peel Sunset C side lost 8-0 to North Ramsey A at the Mooragh Park. Marown the team who appear to be ‘on a roll’ at the moment travelled to Onchan B and took the honours with a 6-2 win with the Onchan winners being Erwin Gelling and Roger Payne. At Finch Hill the honours were even with a 4-4 draw between Finch Hill and Nobles Park B while at the top of the Town Nobles A got back on form by defeating Douglas B 7-1 with Ray Osborne being the Doglas B winner beating Vinty Dugdale 21-19. In a tight match at the Villa Douglas A and Port St Mary A battled for a 4-4 draw with two very close games which saw David Quirk just lose out 21-20 to Brian Lowe and Geoff Mayles edge the game over Ray Maddrell also 21-20. Port Erin hosted Ballaugh B with the Ballaugh boys winning 5-3 despite Port Erin’s Derek Allen having a great 21-3 win over Tom Lord. Another closely fought match was at Port St Mary where Port St Mary B drew with North Ramsey B 4-4. So after Game 5 with Peel Sunset A having a bye, Onchan A losing and Castletown A winning, the top three are Peel Sunset A, Castletown A and Onchan A all on 8 points. Closely following the top three are Nobles A, Castletown B, Marown A and Port St Mary A all on 7 points. The sun shone on the first ladies’ singles open of the season played at Ballaugh for the Pearl Kaighin Trophy, as a field of 32 gathered to do battle. The green was running well, if a little heavier than it’s well mown appearance would suggest. Even in the early stages there were some close matches and as the afternoon progressed the quality of the bowling was apparent. The closest match in the quarter-finals was a family affair with Shelley Kennish coming through 21-20 against Elaine Moore. Quarter-finals: Janet Monk 21, Kim Hargraves 9; Shelley Kennish 21, Elaine Moore 20; Lyn Bolton 21, Mavis Franks 13; Helen Martin 21, Ann Hollingworth 14. This set up two North Ramsey v South Ramsey semi-finals. In the first semi-final Janet Monk came through a tough battle against Shelley, while in the other a combination of Lyn’s good play and Helen “running out of steam” saw the South Ramsey player go through. Semi-finals: Janet Monk 21, Shelley Kennish 16; Lyn Bolton 21, Helen Martin 9. Janet had the better start in the final, being 13-7 up after six ends. The next few ends were shared taking Janet to 15-10 at which point Lyn got the bit between her teeth losing only two more ends before running out the winner 21-17. Richard Faragher thanked those who had stayed to the end, and was pleased that the weather had held fair to the end, before introducing sponsor, Bernard Kaighin, to present his mother’s trophy. Lyn thanked the Ballaugh club and all those who had helped during the afternoon. As we moved into the third game of the Season on Tuesday 11th April we had four Teams on four points at the Top with these being Peel Sunset A, Castletown A, Onchan B and Onchan A and although it is still ‘early days’ I felt that we may be looking at the winner from these Teams with Port St Mary A and Nobles Park A being the other two who could spoil that. The Port St Mary A men and the Nobles A lads obviously agreed with my last comment with Port St Mary A beating Ballaugh A 5-3 at Ballaugh and Nobles Park A had a 6-2 home win against Castletown A.
Douglas A lost 5-3 to Onchan A in a close contest at the Villa which saw a great battle with some very good bowls between Stuart Garrett and Mike Thomas with Mike running out the eventual winner by 21-18. This match also saw a close game between Jimmy Sansom of Douglas and Colin Hinds of Onchan with Jimmy just failing with a great comeback attempt and losing 21-19. Peel Sunset A had a great 8-0 victory over North Ramsey B and the other top of the table men of Onchan B slipped to a 6-2 defeat at Peel Sunset B.
Douglas B went South to Port Erin and returned with a 4-4 draw while Castletown B beat Ballaugh B 5-3 and North Ramsey A beat Nobles Park B 7-1. Finally Port St Mary B travelled to Marown for a 4-4 draw and South Ramsey beat Peel Sunset C 7-1. So after the first three games have been played we see two unbeaten Teams at the top as Peel Sunset A and Onchan A both have six points with Nobles A and Castletown B just being one point behind.